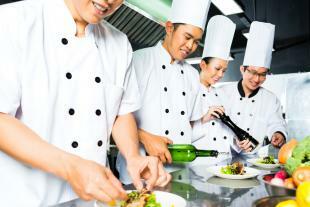 Are Your Food Service Employees “In The Know”? We’re sending some love to the service industry today through our featured courses! We may often focus on business skills, but OpenSesame has plenty of food service and hospitality courses available too. This week we’re highlighting just three of the many. If you’re in the restaurant biz, don’t miss these courses on going green (save the planet! ), hand washing (defeat germs! ), and food safety (trounce food poisoning!). Concerned about sustainability in your company? Green business practices not only help the environment, but can also help minimize your costs. Teach your team to minimize waste and develop greener food service practices with this 15-minute course covering topics including recycling, waste management, and cost considerations. Don’t miss this quick-but-thorough, 6-minute course on the importance of hand washing, when to wash hands, and how to properly wash hands. Restaurant employees must know about proper techniques in order to avoid the negative effects that can be caused by unclean hands in a food service environment. Designed for both managers and employees, this 35-minute course presents important concepts, principles, and procedures that help prevent potentially dangerous food service situations such as physical or chemical contamination, pest infestation, and biological contamination by foodborne pathogens.